Unlike previous episodes, “Form and Void” gave audiences a clear and good look at the culprit Errol William Childress, otherwise known as the “green-eared Spaghetti Monster.” The first five minutes or so of the episode are devoted to Errol’s daily day routine, as he wanders through his desolate home with his slovenly wife, takes on a British accent after seeing an old Cary Grant movie on TV, and works at his job as a painter. Errol also has his dead father chained to a table in a backdoor shed, a group of satanic drawings and structures outside of his home, and a concrete labyrinth in the surrounding woods that may as well come out of The Shining. Errol was insane, but what was so disturbing was how sane he appeared at times. Yes, this was a man with a face covered in hideous scars, but on an initial look he doesn’t appear to be the most notorious serial killer in Louisiana. Errol is chubby, disheveled, and quiet, so much so that in “After You’ve Gone,” he makes peaceful banter with Detectives Gilbough and Papania. Yet this made Errol even more frightening, particularly when he paints the side of a school, watching a group of children playing on the swing sets. And it was only mid-way through the episode when Rust and Marty finally track the Yellow King down, climaxing to a chase between Rust and Errol through the maze behind Errol’s home. 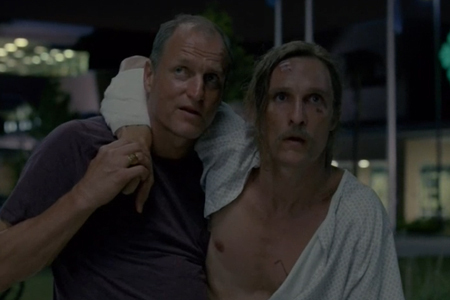 It was the most tense and suspenseful moment in True Detective since the failed heist in “Who Goes There.” After a series of echoing taunts, Rust comes across a dead-end in the maze, a dome where Errol, armed with an axe and knife, quickly attacks him. After Marty intervenes, Rust manages to kill Errol, though both detectives had been severely wounded, bleeding themselves to the point of near-death. But the most important part of “Form and Void” comes later as Marty and Rust recover in the hospital. It’s then when creator Nic Pizzolatto emphasized that both men have changed from the near twenty-year investigation. When his estranged ex-wife and two daughters greet him in his recovery room, Marty acts on good and appropriate terms with his family, suggesting he may have finally gotten rid of his hedonistic ways. The past eight episodes have showed Marty to be selfish and greedy, often misusing and abusing his power for self-gain. He may not have gotten redemption, but it’s clear that Marty is a better man than he was in 1995. Rust finds something else: faith. Rust’s skepticism of life comes from the death of his daughter, which caused him to question the purpose of existence and suffering itself. In his comatose following Errol’s death, though, Rust sees his daughter and realizes that the world around him is composed of good and evil, light and darkness,—and according to Rust, “light’s winning.” It reminded me of the final scene of Twin Peaks: Fire Walk With Me when Laura Palmer in death walks into the Red Room where she discovers happiness. It’s the same for Rust, who during the course of True Detective was searching for spiritual acceptance and has finally found it. No, True Detective isn’t flawless as many of the side characters, in particular the women and victims, aren’t quite well developed but that doesn’t really matter as a whole. What does is the calamity that Marty and Rust have created and that both men have established peace. « What is Your Favorite Matthew McConaughey Role? The whole season was good. The finale may have not been all that great, but at least everything leading-up to it kept everyone guessing and not having a single clue as to what to expect. And best of all, the mystery of “the Yellow King” was pretty rad for the longest time. The finale wasn’t short of its flaws (the lead-up to Errol felt a bit forced), but it shows that True Detective’s one of the best and most suspenseful shows right now. The final scene was the emotional thing on TV since Walter White’s death in Breaking Bad. Thanks! Unfortunately, I don’t have much time to write something up but I appreciate the award. I thoroughly enjoyed True Detective, like you say, its not without its flaws but with that said I was perhaps the most gripping TV series I had seen in quite a while. I agree, there are some missteps, but they’re minimal. This has been the best thing on TV since the conclusion of Breaking Bad. There have been a few good British mini series I have remember being quite impressed with. Broadchurch with Olivia Colman and David Tennant was sublime and of-course Southcliffe with Sean Harris that was gritty and haunting. Definitely worth seeing if you haven’t already. But yes, the conclusion of Breaking Bad was close to perfect.